Over the past month, I’ve been working on a mini-documentary for Current TV’s initiative, “The Current Election 08: What’s Your Issue?” For those of you who don’t know, Current TV is Al Gore’s cable news channel and website for the 18-34 demographic. I decided to address the issue of gay marriage by profiling my high school friend and his boyfriend. In many ways, this doc is a big milestone for me. It’s my first documentary, the first film I’ve made with my own equipment, the first time I’ve shot and lit each and every scene. But even working as a “one-man show,” I had tons of help. 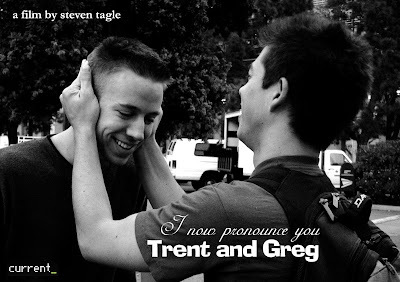 First and foremost, I’d like to thank Trent and Greg for letting me into their lives and for not minding the personal questions and the ever-present camera. As you’ll see, these guys have something truly special, and they showed me what a loving, committed relationship could be like. Second, I’d like to thank Nathan Kurisu, Trent and Greg’s friend, for having the courage to stand up for his beliefs and for offering them humbly. Thanks to Sumi Somaskanda at Current for guiding me through the process and to Danielle Lurie, John Jackson, and Matt Dyer for watching cut after millionth cut. Thanks to maestro Jack Conte for his brilliant music, and Leon Tsikitikos for pulling an all-nighter on my behalf. I’m really proud of this project, and people are responding well to it. Yesterday evening, Current offered to purchase my documentary to broadcast on their cable news station. They are also considering me to join their team at the New Hampshire primaries from January 4-8. Check it out and keep your fingers crossed for me! Excellent Documentary. I saw it over at Towleroad. Any film festival showings in the future? Sundance,SXSW, San Francisco, New York and Seattle come to mind. Let me know about future screenings. Thanks. Hey Jack, thanks so much for going out of the way to find my blog! I do plan on taking this doc to film festivals in the future--I'm working on a new cut of it and will probably get a bit more footage with Trent and Greg. Check this blog for updates!